Climbed on skis January 4, 2004. How to get there: The nearest village is Øystese, about one hour and 20 minutes from Bergen. Drive towards Oslo on E-16, make a left onto Hwy. 7 at the traffic circle in Trengereid. Continue across Kvamskogen to Norheimsund, continue along Hwy. 7 to Øystese. In Øystese, there is a traffic circle near a Statoil gas station. Make a left here, follow signs to Fitjadalen. In summer (and often in winter) this road can be driven to a trailhead at the far end of the lake Fitjadalsvatnet (266m) in Fitjadalen. We arrived early Sunday morning after a snowfall the day before and the road was too slippery/icy at the lower end and not plowed higher up. Under such conditions one may have to start essentially in Øystese. Our starting point was only 10 meters above sea level at coordinates North 60:23.309, East 006:11.888 (we parked in front of a local store). Route description: From Øystese, follow the road to Fitjadalen. This road first climbs significantly, then levels off and runs along the big lake in Fitjardalen. At the far end, you will find a sign for Skrott. The trail heads up through dense forest, first sprouce, later birch. 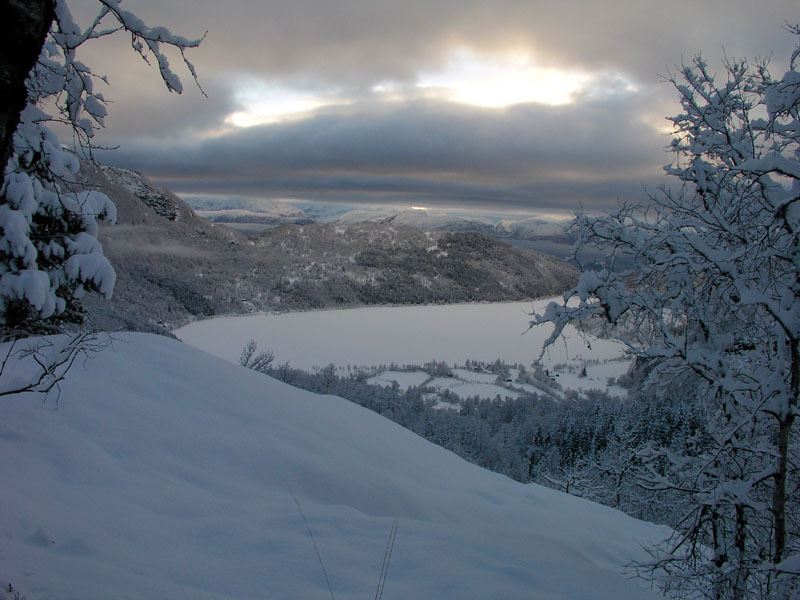 When viewing the mountain from across the lake, there are two distinct "cuts" (small valleys), one called Smørdalen that separates Skrott from Mannfjellet further east, then a smaller one to the left (west). 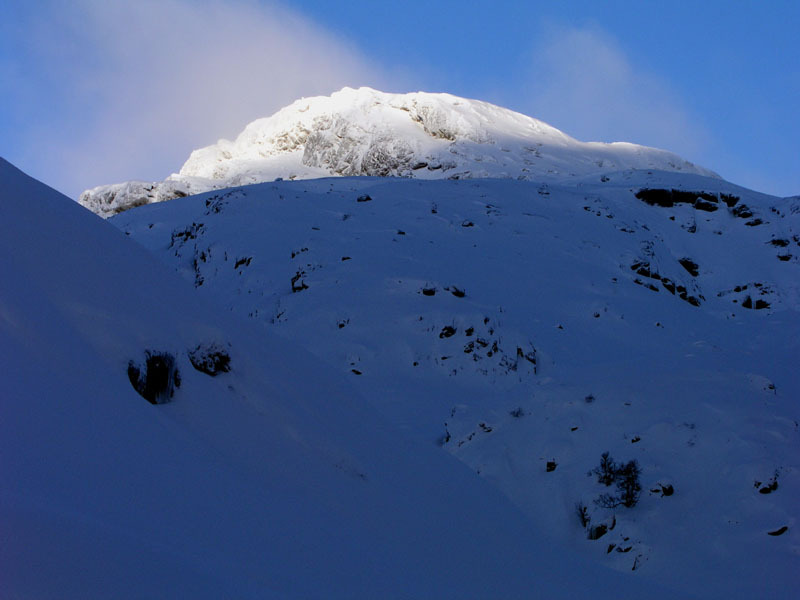 This is the route of ascent, clearly visible on the picture below with a nice V-shaped patch of snow extending downwards into the gully. One most likely is better off by carrying the skis on the backpack here. Higher up, the gully reaches a small saddle, the hut Håsete is there at elevation 760m. Just beyond this hut a small creek comes down a very distinct gully. The normal route proceeds to climb the slope to the left (west) of this gully, eventually reaching a more level plateau south-west of the summit at elevation 1100 meter. There is a second hut located here. From this hut, the route continues up to the right along an ascending ramp leading to a pretty broad ledge. This ledge runs south of the peak and turns more narrow just before it provides a very nice access to the upper part of the south ridge. We skied around this section, but skiers should check this passage carefully, possibly proceeding by foot. This is not a place to slip and slide off the cliff. Finally, continue near the ridge on an easy slope to the summit. Comments: I did this climb with my friend Arnt. 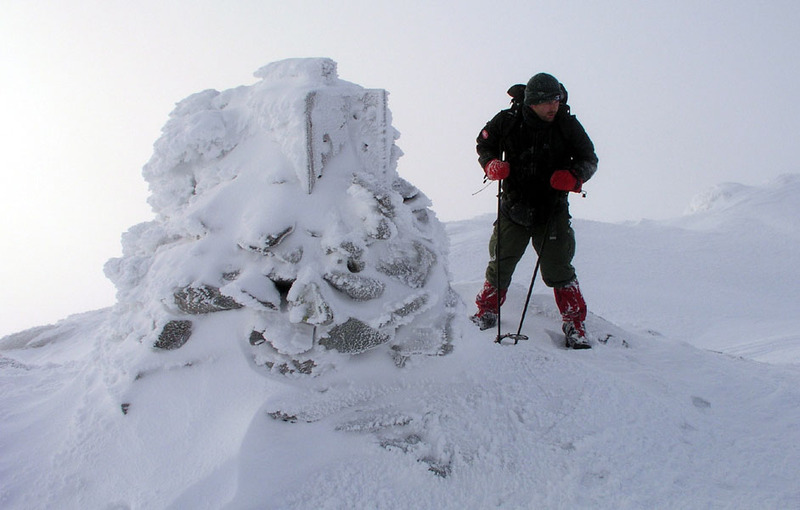 We started at 0900, hit the summit at 1430 (after quite some struggle in deep snow). Returned to the car at 1700. Almost half a meter of snow fell in the previous two days, we started at 10 meter so 1310 meter of vertical gain. It is a safe bet that we were the first visitors in 2004. Skrott and nearby mountains in Kvamskogen as seen from the air. 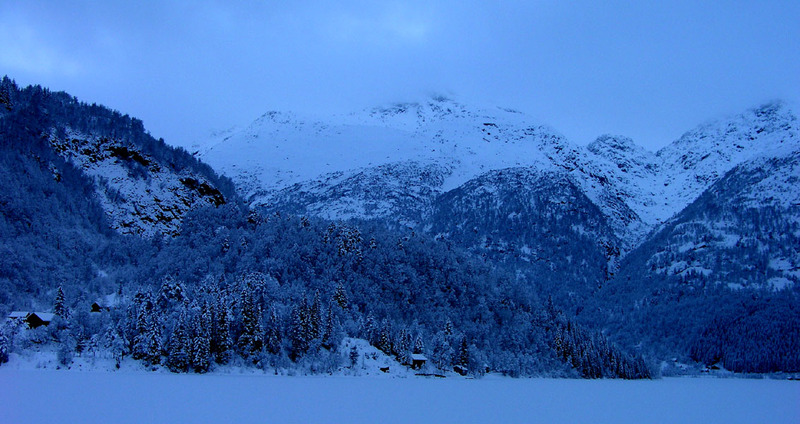 Skrott as seen across the Fitjadalen lake. A nice view, while climbing through the tree zone. Skrott seen from the first hut above the treeline. Arnt on the summit of Skrott.